Irom Sharmila on Thursday filed her nomination papers to contest from Thoubal constituency in the Manipur assembly elections. IMPHAL: 'Iron Lady' Irom Sharmila on Thursday filed her nomination papers to contest from Thoubal constituency in the Manipur assembly elections. "I am fighting the Chief Minister. I want to become the Chief Minister to repeal the AFSPA. 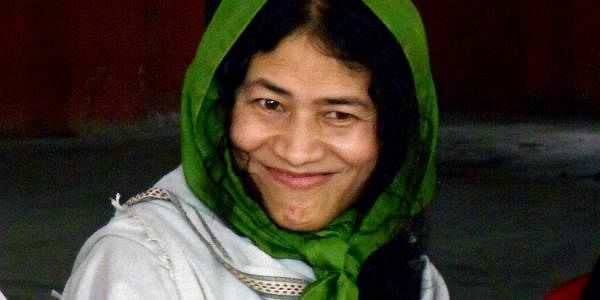 I will work for economic independence and other welfare measures for the people," said Sharmila, who came in international limelight by continuing her fast-unto-death for 16 years to demand the repeal of the Armed Forces (Special Powers) Act, 1958. The civil rights activist, a greenhorn in electoral battle, will be pitted against Congress candidate and Chief Minister Okram Ibobi Singh. Thursday was the last day for filing the papers. The two-phased elections are slated to be held on March 4 and 8. The 44-year-old Sharmila ended her indefinite hunger strike in August last year. She launched People's Resurgence and Justice Alliance in October last and said she will fight elections from Thoubal as well as Khurai, from where she hails. Chief Minister Okram Ibobi Singh, who also filed his nomination papers on Thursday, wished her luck. "It is her democratic right to contest elections. My best wishes are with her," he said.